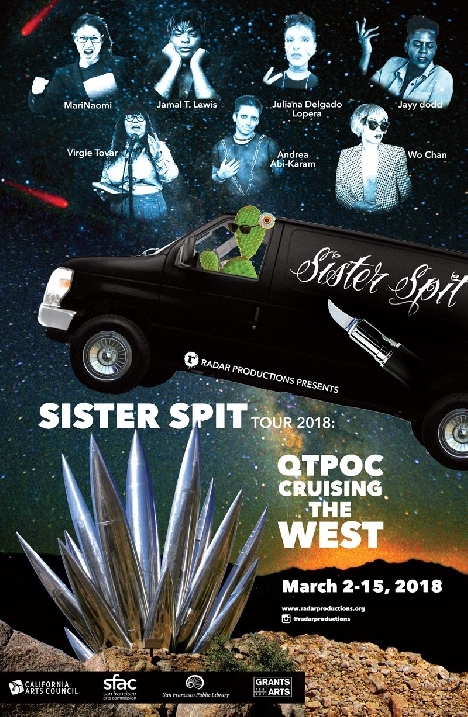 Sister Spit Workshop and Performance Dinner: Come "spill the tea" with Sister Spit - a remarkable group of 7 QTPOC (Queer, Transgender, People of Color) writers and multi-disciplinary artists as they tour the West Coast, I-House being their only East Bay venue. Come "spill the tea" with Sister Spit - a remarkable group of 7 QTPOC (Queer, Transgender, People of Color) writers and multi-disciplinary artists as they tour the West Coast, I-House being their only East Bay venue. Join us for this intimate affair with fancy dinner and tea included. Featuring: MariNaomi, Wo Chan, Jayy Dodd, Virgie Tovar, Andrea Abi-Karam, Jamal Lewis and Juliana Delgado Lopera who welcome attendees of all genders, as they explore the intersections of feminism, queerness, humor and provocation.